When you are initially given access to your school's directory, you will receive an email with a temporary password. At a later date, you can change both your password and your email. From the Menu, select Your Account. 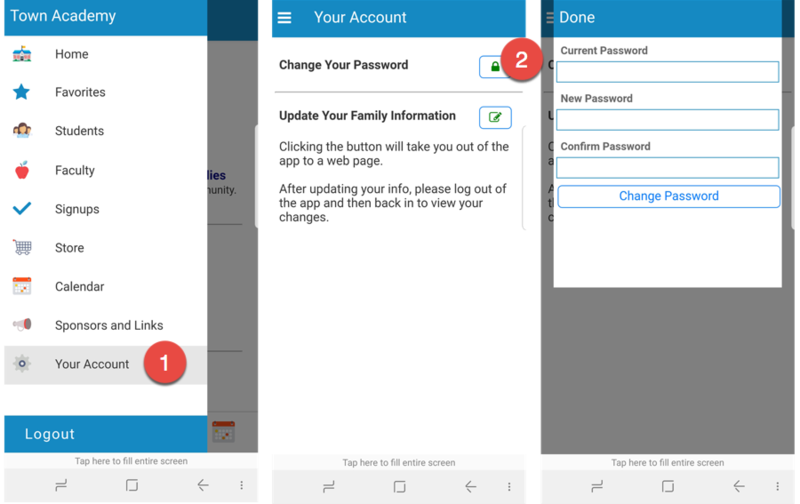 Choose Update your Family Information which will take you out of the app to a browser session. In Section 2, under the applicable parent, select Change Email. From the Menu, select Your Account. Choose Change your Password. Select Your Account from the blue menu bar. Choose Change Login. You'll see two options: Change Password or Change Email. Select the one you need to complete the action. Another method is to request a password reset email from MSA. From the Login screen on our mobile App or from a mobile browser, https://www.myschoolanywhere.com/login.a5w, select "Forgot your password?". You will be prompted to enter your email address. After doing so, a link to reset your password will be emailed to you.